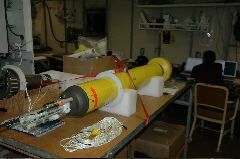 We have deployed 3 APEX-SBE profilers with oxygen sensors to provide background profile context for the AAIW formation experiment. The floats are parked at 500 dbar and alternately profile from 500 dbar and 1800 dbar to the surface every 5 days. The first figure shows the current position of the floats. click on thumbnails to expand plot. 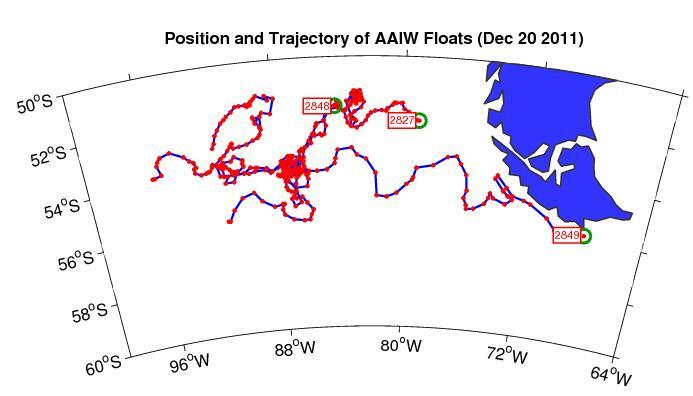 for a more comprehensive set of plots, click on "28nn SIO"
for link to original data, click on "28nn UW"
Float 2849: March 10, 2007, float is effectively beached. Stopped reporting May 4, 2007 after 86 profiles. Float 2848: September 25, 2007, float stopped reporting after 117 profiles. Float 2827: May 21, 2008, float stopped reporting after 165 profiles. This material is based upon work supported by the National Science Foundation under Grant No. OCE-0327544.